Morning crew. Really windy here last night and early morning. Kept me up and then it started pouring. So much for 50°. Off to my shatty job. Goooood morning! Have a great day. Morning guys. Man it's been a long couple of weeks around here. Lots of snow, missing dog, tragic fire, fund raisers. Now it's time to move forward and start to rebuild, and I think spring has finally started to come around. Just got home from mine. Worked 10 hours of OT last night, so now I have one day off and back to it. 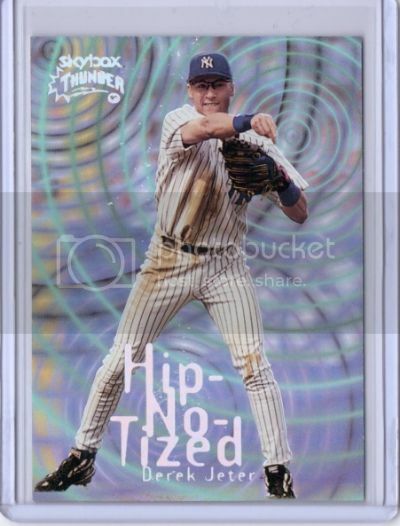 Thats a nice Jeter card Pete. Does it have a refractor like finish and change colors near a light? Nice win by the Jays over the Rays last night. Bautista hit homeruns numbers 1 and 2 of the season, and Buerhle went 8 2/3 shutout innings with 11 K's. Enfuego79....hope to get a good report back from you soon. Prayer lifted up for you.